The Interactive website CelloBello offers a broad selection of free resources covering every aspect of learning and playing the cello. Launched in 2010 by Founder and Artistic Director Paul Katz, former cellist with the Cleveland Quartet and current Professor of Cello at the New England Conservatory in Boston, CelloBello's online resources include master classes, interviews, a blog, and interactive chats with artist-teachers from the solo, chamber music, orchestral, and teaching professions. The website is loaded with high quality video resources, all presented in an attractive and accessible framework. ACMP member Louise Bozorth (Vc, NYC), reviewed the site and shared her impressions, saying, "because Cellobello is such a clearly constructed site, it's easy to navigate. The Cellofun section features pages of jokes, stories, pictures, and video to keep any serious cellist entertained for hours. One favorite is an hysterical video of four cellists playing Ravel Bolero on one cello." "Cellobello is like having a conservatory in your living room." 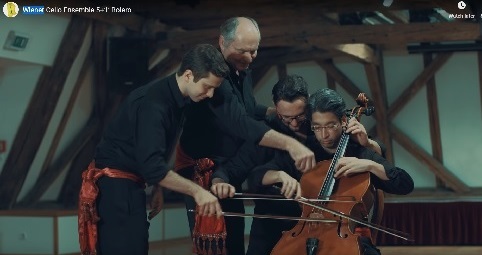 Louise adds: "Another highlight on the site is Cellostream, featuring well-known cellists who have made videos on masterpieces of the cello repertoire including one by Peter Wispelwey on the Bach Cello Suite No. 1 in which he makes wonderful comments on Bach's emphasis on the bass line." And if that's not enough, put down your cello and browse the extensive selection of cello reading recommendation on the CelloBooks page, including biography, technique, and more.